IL-12p35−/−p40−/− mice are highly susceptible to Mycobacterium bovis bacillus Calmette-Guérin (BCG) or Mycobacterium tuberculosis infection. In this study IL-12p35−/− mice, which are able to produce endogenous IL-12p40, cleared M. bovis BCG and showed reduced susceptibility to pulmonary M. tuberculosis infection, which was in striking contrast to the outcome of mycobacterial infection in IL-12p35−/−p40−/− mice. Resistance in wild-type and IL-12p35−/− mice was accompanied by protective granuloma formation and Ag-specific delayed-type hypersensitivity responses, which were impaired in susceptible IL-12p35−/− p40−/− mice. Furthermore, IL-12p35−/− mice, but not IL-12p35−/−p40−/− mice, mounted Ag-specific Th1 and cytotoxic T cell responses. In vivo therapy with rIL-12p40 homodimer restored the impaired delayed-type hypersensitivity responses in M. bovis BCG-infected IL-12p35−/−p40−/− mice and reverted them to a more resistant phenotype. Together, these results show evidence for a protective and agonistic role of endogenous and exogenous IL-12p40 in mycobacterial infection, which is independent of IL-12p70. Tuberculosis, caused by Mycobacterium tuberculosis, is the most prevalent infectious disease worldwide, which kills more than 3 million people per year (1, 2, 3). Protective cell-mediated (type 1) immune responses are known to be critical in host defense against intracellular mycobacterial infection. Ag-specific T cells play an important role in protective granuloma formation by secreting type 1 cytokines, particularly IFN-γ and TNF-α (2, 4, 5). These cytokines stimulate the antimicrobial activity of infected macrophages, allowing intracellular mycobacterial killing. The key factor for the release of IFN-γ by NK and Th1 cells is IL-12 (6, 7). It is produced by APCs upon interaction with mycobacteria (8). In addition, IL-12 has direct stimulatory effects on effector functions of CD8+ T cells (9), which are critical for an effective control of mycobacterial infection (2, 10). It has been shown that in the absence of endogenous IL-12, mice are highly susceptible to mycobacteria due to impaired type 1 cytokine responses and granuloma formation (11, 12). IL-12, originally called NK cell stimulatory factor (13) or CTL maturation factor (14), is a 70- to 75-kDa heterodimer (IL-12p70) consisting of disulfide-bonded 35-kDa (p35) and 40-kDa (p40) subunits (13, 14). The biological activities of IL-12p70 are mediated through the high-affinity IL-12R, which is composed of IL-12Rβ1 and IL-12Rβ2 chains (15). The biological activity of heterodimeric IL-12p70 requires the interaction of p40 with IL-12Rβ1 and the interaction of p35 with IL-12Rβ2 (15). In contrast, p40 homodimer (p(40)2),4 which binds to the IL-12Rβ1, has been shown to exert an antagonistic activity on IL-12Rβ1 in both in vitro and in vivo systems by inhibiting the biological activity of IL-12p70 (16, 17). Because secretion of IL-12p70 is associated with excess production of p(40)2 (14, 18), it has been proposed that excess p40 may down-regulate IL-12-mediated immune responses (19, 20). However, phenotypic differences between IL-12p35−/− and IL-12p40−/− mice have indicated an agonistic role of homodimeric IL-12p40 in some systems, including cardiac allograft rejection (21) and cryptococcal infection (22). In the present study, IL-12p35−/− mice, which secrete normal concentrations of the p40 subunit (23), and IL-12p35−/−p40−/− mice were infected with Mycobacterium bovis bacillus Calmette-Guérin (BCG) or M. tuberculosis to evaluate the role of endogenously produced IL-12p40 in mycobacterial infection. We report a protective and agonistic function of IL-12p40 in mycobacterial infections with a therapeutic effect of IL-12p(40)2 in mice. IL-12p35−/− (23) and IL-12p40−/− mice (24) on a 129Sv/Ev background, were backcrossed five times to C57BL/6. Mutant and C57BL/6 wild-type mice were maintained under specific pathogen-free conditions. For generation of homozygous double-deficient mice, IL-12p35−/− and IL-12p40−/− mice were intercrossed and genotyped by PCR. For experiments, animals were kept in autoclaved cages with autoclaved bedding, food, water, and microfilter lids. All experiments performed were in accordance with the guidelines of the Animal Research Ethics Board of the University of Cape Town (Cape Town, South Africa). Mycobacteria were grown in Middlebrook 7H9 broth (Difco, Detroit, MI) supplemented with Middlebrook oleic acid, dextrose, and catalase enrichment medium (Life Technologies, Gaithersburg, MD), 0.002% glycerol, and 0.05% Tween 80. Midlog phase cultures were harvested, aliquoted, and frozen at −80°C. After thawing, viable cell counts were determined by plating serial dilutions of the cultures on Middlebrook 7H10 agar plates followed by incubation at 37°C. Mycobacterial strains M. bovis BCG (Pasteur) and M. tuberculosis (H37Rv) were used and experiments were performed in level II and level III biohazard facilities. Before infection with M. bovis BCG or M. tuberculosis, stock solutions of mycobacteria were diluted in PBS, and the preparation was sonicated to ensure proper dispersion of mycobacteria. For i.v. infection with M. bovis BCG, mice were infected with 2 × 106 CFU mycobacteria via a lateral tail vein. Pulmonary infection with M. tuberculosis was performed in an inhalation exposure system (Glas-Col, Terre-Haute, IN). Mice were exposed for 40 min to an aerosol generated by nebulizing ∼5.5 ml of a suspension containing 107 live bacteria. Inoculum size was checked 24 h after infection by determining the bacterial load in the lung of infected mice. Bacterial loads in the lung, liver, and spleen of infected mice were evaluated at different time points after infection with M. bovis BCG or M. tuberculosis. Organs were weighed and defined aliquots were homogenized in 0.04% Tween 80 saline. Tenfold serial dilutions of organ homogenates were plated in duplicates onto Middlebrook 7H10 agar plates containing 10% oleic acid, dextrose, and catalase and incubated at 37°C for 19–21 days. Colonies on plates were enumerated and results are expressed as log10 CFU per organ. For analysis mice were killed by cervical dislocation. Organs were fixed in 4% buffered formalin and paraffin-embedded. Two- to 3-μm sections were stained with H&E and a modified Ziehl-Nielsen method. The latter involved staining in a prewarmed (60°C) carbol-fuchsin solution for 30 min followed by 30 min at room temperature; destaining was performed for 1 min in 0.5% HCl-ethanol before counterstaining with hematoxylin for 4 min. Frozen tissue sections were prepared using a cryostat (Leica CM 1850) and 3-aminopropyltriethoxysilane-coated slides. Seven-micrometer sections were air-dried and fixed in 75% acetone and 25% ethanol for 5 min before storage at −80°C. Slides were washed in PBS and incubated with a primary Ab against CD4 (clone GK 1.5) for 90 min at room temperature. After incubation with appropriately diluted rabbit anti-rat mAb coupled with Texas Red (Jackson Immuno-Research Laboratories, West Grove, PA) for 30 min at room temperature, sections were mounted in Fluoromount (DAKO, Carpinteria, CA) and assessed by immunofluorescence microscopy (Nikon, Randburg, South Africa). Infected mice were challenged in the right footpad with 10 μg of purified protein derivative (PPD; State Vaccine Institute, Pinelands, South Africa) in 50 μl of PBS and in the left footpad with 50 μl of PBS alone. Swelling in each footpad was measured after 24, 48, and 72 h using a Mitutoyo micrometer caliper (Brütsch, Zürich, Switzerland), and the difference was taken as the amount of Ag-specific delayed-type hypersensitivity (DTH). The PPD preparation did not induce swelling in noninfected animals. For measuring Ag-specific production of IFN-γ, single cell suspension of peripheral lymph nodes were prepared from mice 8 wk after infection with M. bovis BCG. Cells were resuspended in IMDM (Life Technologies, Paisley, U.K.) supplemented with 10% FBS (Life Technologies), 0.05 mM 2-ME (Sigma, Cape Town, South Africa), and penicillin and streptomycin (100 U/ml and 100 μg/ml; Life Technologies). Lymph node cells (2 × 106) were incubated with 2 × 104 peritoneal macrophages that were pulsed for 4 h with 2 × 105 M. bovis BCG and 1 μg of PPD in antibiotic-free IMDM. Resident peritoneal macrophages were obtained 1 day before the experiment by peritoneal lavage of uninfected C57BL/6 mice and incubated in 96-well flat-bottom microplates (Nunc, Naperville, IL) in complete IMDM. To determine mycobacterial Ag-specific IFN-γ production, 100 μl of supernatants from cultures were taken and kept frozen at −80°C. IFN-γ levels were analyzed in 3-fold serial dilutions using a sandwich ELISA with coating and biotinylated anti-IFN-γ mAbs (BD PharMingen, San Diego, CA), as previously described (25). The detection limit was 200 pg/ml. Peripheral lymph nodes were obtained 8 wk after infection with M. bovis BCG and single cell suspensions were prepared in IMDM. Enrichment of CD4+ T cells was performed by positive selection with magnetic mouse CD4 Dynabeads and mouse CD4 DETACHaBEAD (Dynal, Lake Success, NY). CD8+ cells were enriched by incubation of the CD4+-depleted cell suspension with anti-B220-specific Dynabeads. Positively selected CD4+ T cells from lymph nodes contained >90% CD4+ cells, and negatively enriched CD8+ T cell suspensions contained >90% CD8+ cells, as determined by flow cytometry analysis (26). In vitro responses to mycobacterial Ags were measured as described previously (27), with slight modifications: 4 × 105 CD4+ enriched lymph node cells obtained from infected mice were cultured with 2 × 104 peritoneal macrophages pulsed with 2 × 105 M. bovis BCG and 1 μg of PPD for 4 h in antibiotic-free IMDM. Resident peritoneal macrophages were obtained 1 day before the experiment from peritoneal lavages of uninfected C57BL/6 mice and incubated in 96-well flat-bottom microplates (Nunc) in complete IMDM. CD4+ T cells and pulsed macrophages were incubated for 72 h at 37°C and 5% CO2. For the proliferation assay, 1 μCi of [3H]thymidine was added for the last 10 h of culture. After harvesting, thymidine incorporation was measured in a liquid scintillation counter. The cytotoxic activity of CD8+ T cell-enriched lymph node cells was performed as previously described in a 4-h 51Cr release assay (28). Effector cells were harvested and cultured in complete IMDM with 10 μg/ml PPD at 37°C and 5% CO2. For a source of target cells, macrophages were obtained from peritoneal lavages of uninfected C57BL/6 mice, seeded at 1 × 104 cells/well in 96-well round-bottom microplates (Nunc) in antibiotic-free IMDM. Cells were then pulsed with 1 × 105 M. bovis BCG, 1 μg of PPD, and 2 μCi of 51Cr (Amersham Pharmacia Biotech, Piscataway, NJ). After washing of target cells, effector cells were added at different E:T ratios and plates were incubated for 4 h at 37°C. A 100-μl volume of supernatant was then collected from each well, and radioactivity release was measured in a Packard gamma counter (Cobra III; Packard Intrument, Downers Grove, IL). The percentage of specific lysis was calculated taking into account spontaneous and maximum release of target cells incubated with medium alone or 100% Triton X-100 as follows: [(experimental release − spontaneous release)/(maximum release − spontaneous release)] × 100. Homodimeric IL-12p40 was produced by Chinese hamster ovary cells stably transfected with mouse IL-12p40 cDNA and purified as described previously (29). Purified IL-12p(40)2 was >95% pure, as assessed by SDS-PAGE. Briefly, samples were boiled in SDS-PAGE buffer for 2 min and separated on a 5–15% polyacrylamide gradient gel (Life Technologies). Gels were stained in Coomassie brilliant blue (Sigma-Aldrich, St. Louis, MO) for 6 h and destained overnight before visualization of protein bands. For immunoblotting, procedures were conducted at room temperature and Abs were diluted in blocking buffer (PBS/5% skim milk powder). Proteins were transferred (semidry in-house blotting apparatus) onto polyvinylidene difluoride membranes (Amersham Pharmacia Biotech). Membranes were blocked for 4 h and incubated in a 1/1500 dilution of rat anti-mouse IL-12p40 mAb (C15.6, 2 mg/ml; BD PharMingen) for 3 h. After three washes in PBS/0.05% Tween 20, membranes were incubated for 1 h in a 1/1000 dilution of rabbit anti-rat IgG (H and L chains) alkaline phosphatase-conjugated Ab (1 mg/ml; Southern Biotechnology Associates, Birmingham, AL). Washing was repeated and membranes were developed with nitroblue tetrazolium/5-bromo-4-chloro-3-indolyl phosphate tablets (Roche Diagnostic Systems, Indianapolis, IN) for 15 min. SDS-PAGE and results were verified using IL-12 anti-sera. Endotoxin contamination was <10 IU/mg IL-12p(40)2, as measured by the Limulus amebocyte lysate assay (M. Gately, unpublished observation). M. bovis BCG-infected mice received either 60 μg of rIL-12p(40)2 i.p. or PBS as control daily for 28 days. Total RNA was extracted from homogenized mouse spleen, liver, and lung using TriReagent (Molecular Research Center, Cincinnati, OH), and DNA contamination was digested by molecular grade RNase-free DNaseI (Promega, Madison, WI) as per the manufacturer’s instructions. The purity and integrity of the RNA was controlled by absorbance at A260/280 and gel electrophoresis. Absence of contaminating genomic DNA was verified by real-time PCR amplification of the RNA using the β-actin primers. Reverse transcription was performed in 30-μl total volume, including 10 ng of total RNA in 50 mM Tris-HCl (pH 8), 75 mM KCl, 3 mM MgCl2, 110 mM DTT, 0.5 mM each dNTPs, 0.7 U/μl RNasin (Promega), and 16 U/μl Moloney murine leukemia virus reverse transcriptase (Life Technologies), and incubated at 40°C for 2.5 h before inactivation of enzyme activity at 75°C for 15 min. The levels of β-actin, IL-12p40, p19, and IL-18 mRNA in the cDNA were quantified by real-time PCR on a Lightcycler (Roche Diagnostic Systems). Hot start PCR was performed in 20 μl containing 50 mM Tris-HCL (pH 8.3), 4 mM MgCl2, 500 μg/ml BSA, 200 μM dNTPs, 0.125 U/μl Taq, 0.175 μM Taqstart Abs, 0.25 μM primers, and 2 μl of cDNA template and monitored in real time with the fluorescent DNA binding dye SYBR green (Roche Diagnostic Systems). The following primer pairs were used: β-actin (forward 5′-ACCCACACTGTGCCCATCTA-3′, reverse 5′-ATCGGAACCGCTCGTTGC; 321-bp product), IL-12p40 (forward 5′-CAGCTCGCAGCAAAGCAA-3′, reverse 5′-GACGCCATTCCACATGTCACT3′; 530-bp product), IL-18 (forward 5′-TGGTTCCATGCTTTCTGG-3′, reverse 5′-TCCGTATTACTGCGGTTGT-3′; 279-bp product), and p19 (forward 5′-TGCTGGATTGCAGAGCAGTAA-3′, reverse 5′-GCATG CAGAGATTCCGAGAGA-3′; 121-bp product). Standard curves for β-actin, IL-12p40, IL-18, and p19 were generated by performing 2-fold dilutions of positive samples. 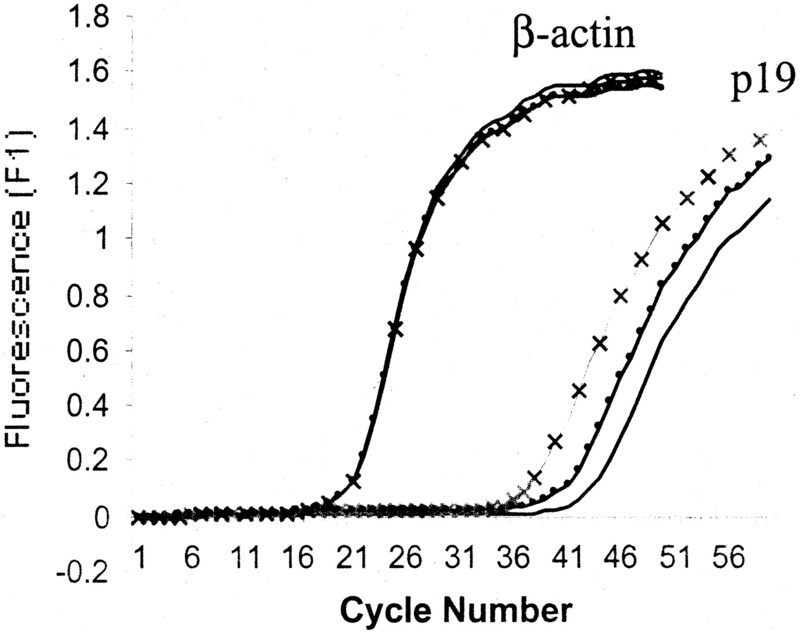 The mRNA level for each sample was normalized by dividing the calculated value by the housekeeping β-actin value. The various mRNA levels in the mutant mice were then relatively quantified in comparison to the respective levels in wild-type mice using the relative standard curve method (Applied Biosystems, Foster City, CA). Data are expressed as the means of individual determinations and SDs. Statistical analysis was performed using the Student’s t test or the Mann-Whitney rank sum test. To determine the role of IL-12p40 during infection with M. bovis BCG, we compared IL-12p35−/−p40−/−, IL-12p35−/−, and C57BL/6 wild-type mice. IL-12p35−/− mice produce normal levels of endogenous IL-12p40 (23). 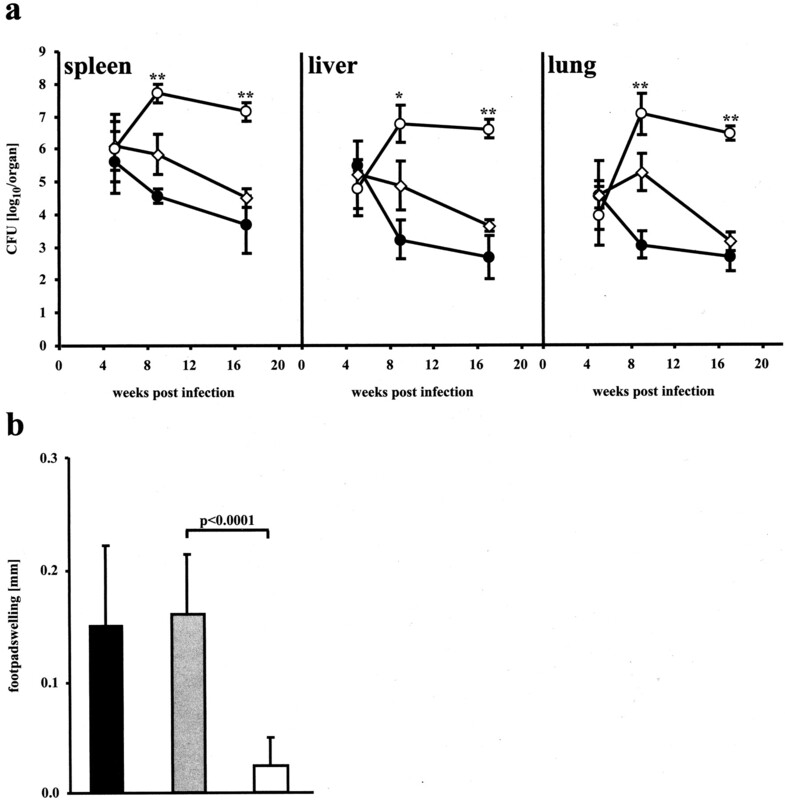 Wild-type as well as IL-12p35−/− mice were able to clear bacterial burden in infected organs, shown by decreased bacterial loads in spleen, liver, and lung during the monitored 17 wk of infection (Fig. 1⇓a). In contrast, IL-12p35−/−p40−/− mice showed 3- to 4-log higher CFUs relative to IL-12p35−/− and wild-type mice, resulting in an inability to control infection (107–108 CFU/organ). Of importance, all IL-12p35−/−p40−/− mice survived infection but were chronically infected, with multiple bacterial and inflammatory infiltrates resulting in severe pathology in spleen (splenomegaly), liver, and lung (data not shown), 7 mo postinfection. Four weeks postinfection, T cell-driven Ag-specific immune responses were present in IL-12p35−/− mice, which also exhibited a similar DTH reaction to wild types, using the Ag-specific footpad rechallenge model by injection of PPD of M. tuberculosis, measured 24, 48, and 72 h postinjection. In striking contrast, IL-12p35−/−p40−/− mice were unable to mount a DTH response 4 (Fig. 1⇓b) or 6 wk (data not shown) postinfection. These results suggest a role of IL-12p40 in mediating specific immune responses during infection with M. bovis BCG, which is independent of bioactive IL-12p70. IL-12p35−/− mice clear i.v. infection with M. bovis BCG with an Ag-specific immune response. Mice were infected i.v. with 2 × 106 CFU of M. bovis BCG. a, For mycobacterial colony enumeration, spleen, liver, and lungs were taken from five C57BL/6 (•), IL-12p35−/− (⋄), and IL-12p35−/−p40−/− mice (○) at 5, 9, and 17 wk postinfection. Differences between IL-12p35−/− and IL-12p35−/−p40−/− mice were statistically significant (∗, p < 0.01; ∗∗, p < 0.001). b, For measuring DTH, C57BL/6 (filled bar), IL-12p35−/− (shaded bar), and IL-12p35−/−p40−/− mice (open bar) were challenged in the left hind footpad with PBS and the right footpad with 10 μg of PPD of M. tuberculosis at wk 4 after infection. Differences in footpad swelling between IL-12p35−/− and IL-12p35−/−p40−/− mice were highly significant (p < 0.0001). These results are representative of four experiments. Protective immunity during mycobacterial infection is dependent on granuloma formation leading to control and containment of the infection, which is closely associated with T cell responses. In agreement with the bacterial burden, histological examination of acid fast bacilli in hepatic granulomas 9 wk postinfection revealed only few bacilli in wild-type (Fig. 2⇓, a and d) or IL-12p35−/− mice (Fig. 2⇓, b and d) but abundant bacilli in IL-12p35−/−p40−/− mice (Fig. 2⇓, c and d). Increased numbers of multibacillary granulomas were also observed in IL-12p35−/−p40−/− mice at 5 wk postinfection when CFUs between mutant strains were still comparable (Table I⇓). This indicates an impairment of granuloma function in double-deficient mice. Subsequent cellular analysis by immunohistochemistry showed sparsely infiltrated CD8+ T cells within the granulomas of all strains of mice (data not shown). In IL-12p35−/− mice (Fig. 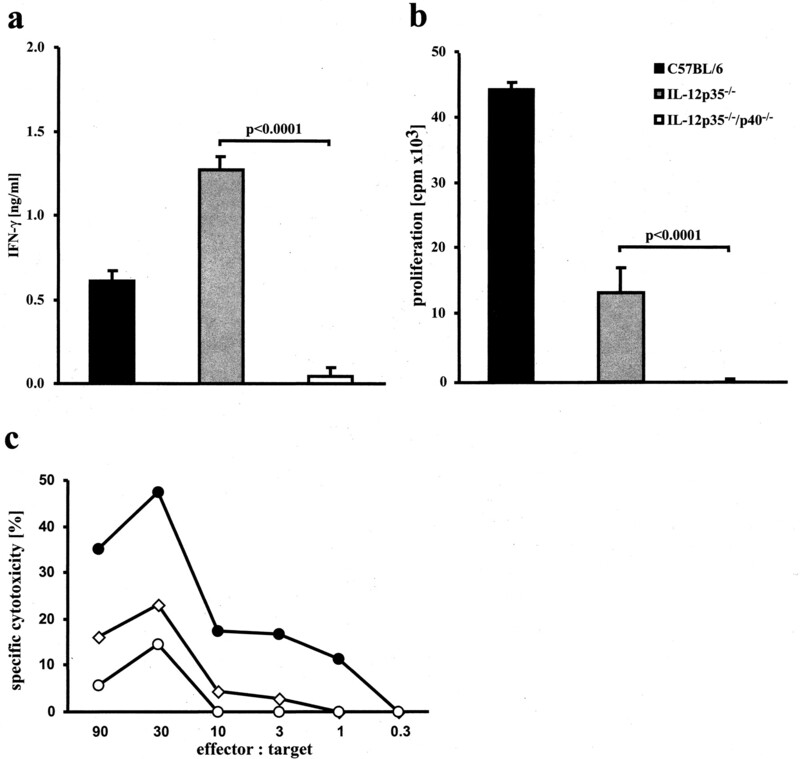 2⇓f) similar numbers of infiltrating CD4+ T cells were found compared with C57BL/6 controls (Fig. 2⇓, e and h). In contrast, IL-12p35−/−p40−/− mice showed significant reduced CD4+ T cell infiltrates (Fig. 2⇓, g and h) with diffuse formation within the granuloma comprising large areas with foamy macrophages (Fig. 2⇓g) due to the presence of many bacilli (Fig. 2⇓c). Together, these data show that granuloma formation and function is present in IL-12p35−/− mice but impaired in IL-12p35−/−p40−/− mice. Efficient granuloma formation and function in IL-12p35−/− mice. Nine weeks follow an i.v. infection with 2 × 106 CFU of M. bovis BCG, livers were taken from C57BL/6, IL-12p35−/−, and IL-12p35−/−p40−/− mice (five mice per group) for histological analysis. a–c, Sections were stained with Ziehl-Nielsen and counterstained with hematoxylin. Bacteria (red/pink staining) were essentially absent in hepatic granulomas from C57BL/6 (a) and IL-12p35−/− (b) mice but abundant in IL-12p35−/−p40−/− (c) mice (bar = 50 μm). d, Bacteria containing granuloma. Results are shown as means and SDs of five mice per group. e–g, Immunofluorescence of CD4+ T cells within hepatic granulomas. 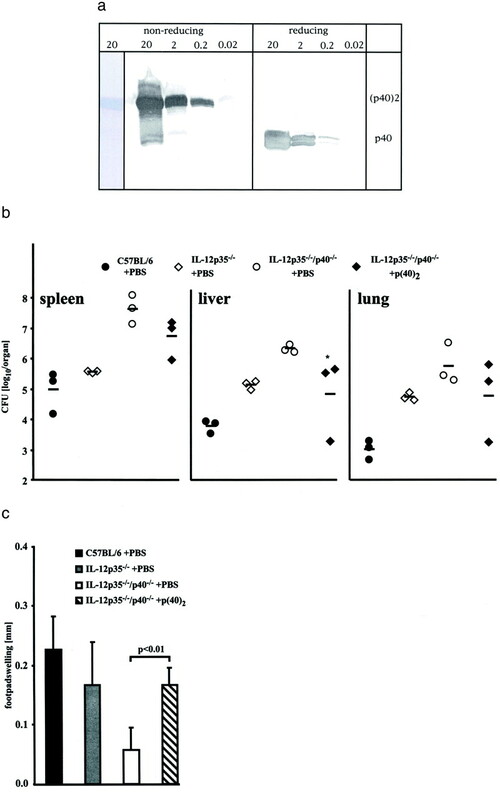 CD4+ T cells were prominent in tissue from C57BL/6 (e) and IL-12p35−/− (f) mice (five mice per group) but dispersed in tissue from IL-12p35−/− p40−/− mice (g) (bar = 50 μm). h, CD4+ cells were counted from 25 granulomas of five mice per group. Differences between IL-12p35−/− and IL-12p35−/−p40−/− mice were highly significant (p < 0.0001). To determine whether the observed differences between IL-12p35−/− and IL-12p35−/−p40−/− mice were directly mediated by IL-12p40, M. bovis BCG-infected IL-12p35−/−p40−/− mice were supplemented in vivo by administering rIL-12p(40)2, produced by a transfected Chinese hamster ovary cell line (kindly provided by M. Gately, Hoffmann-LaRoche, Nutley, NJ). Immunoblotting of purified IL-12p(40)2 with anti-IL-12p40 mAbs revealed a purity of 99% IL-12p40 homodimer and ∼1% IL-12p40 monomer (Fig. 3⇓a). After 9 wk postinfection, increased resistance in p40-supplemented IL-12p35−/−p40−/− mice was observed, resulting in a 10- to 15-fold reduction of bacterial burden in infected organs compared with nonsupplemented but infected IL-12p35−/−p40−/− mice. Similar CFUs in liver and lung were found in IL-12p35−/− mice as compared with wild-type mice (Fig. 3⇓b). Importantly, supplementation with IL-12p40 was able to fully restore the Ag-specific recall response in infected IL-12p35−/−p40−/− mice, demonstrated by a comparable DTH response to infected IL-12p35−/− and C57BL/6 mice (Fig. 3⇓c). In summary, these results demonstrate that exogenously administrated p(40)2 is able to restore some of the defective functions observed in IL-12p35−/−p40−/− mice, which suggests an agonistic role for IL-12p40 in the absence of bioactive IL-12p70. Supplementation with IL-12p(40)2 reduces bacterial burden and restores Ag-specific DTH of BCG-infected IL-12p35−/−p40−/− mice. a, SDS-PAGE and Western blot of purified IL-12p(40)2; first lane, 20 μg of Coomassie brilliant blue-stained IL-12p(40)2; other lanes, identification of homodimeric p(40)2 or monomeric p40 in a Western blot using rat anti-IL-12p40 mAb and rabbit anti-rat IgG (H and L chains) alkaline phosphatase-conjugated Ab under nonreduced and reduced conditions as a standard (20–0.02 μg loaded), showing ∼1% monomeric p40. b and c, C57BL/6, IL-12p35−/−, and IL-12p35−/−p40−/− mice that were infected i.v. with 2 × 106 CFU of M. bovis BCG received i.p. 200 μl of PBS daily as control. Three IL-12p35−/−p40−/− mice received a daily i.p. injection of 60 μg/day of rIL-12p(40)2 for 28 days, the remaining PBS only. b, Mycobacterial CFUs from spleen, liver, and lungs at 9 wk postinfection. Data are shown from individual mice and the means are indicated. ∗, p < 0.05 compared with PBS-treated IL-12p35−/−p40−/− mice (Mann-Whitney rank sum test). c, Four weeks postinfection DTH was measured using 10 μg of PPD of M. tuberculosis. Differences in footpad swelling between IL-12p35−/−p40−/− plus PBS and IL-12p35−/− p40−/− plus p(40)2 mice, shown at 48 h, were significant (p < 0.01). These results are representative of two experiments. IL-12p70 promotes Th1 differentiation leading to IFN-γ production and a type 1 cellular immune response. Therefore, we compared Ag-specific T cell functions in response to BCG infection. Lymph nodes from infected mice were isolated 9 wk postinfection and cells were restimulated with Ag-presenting peritoneal macrophages in vitro to measure IFN-γ responses by T cells. The ratio and percentage of CD4+ and CD8+ T cells were similar in all three strains as determined by FACS analysis (data not shown). Lymphocytes from wild-type as well as from IL-12p35−/− mice showed a marked and comparable IFN-γ response (Fig. 4⇓a). In contrast, this response was abolished in lymphocytes from IL-12p35−/−p40−/− mice. Next, the Ag-specific proliferative response of CD4+ T cells was determined by coculturing enriched CD4+ T cells from infected mice with M. bovis BCG-infected peritoneal macrophages (Fig. 4⇓b). In comparison to the Ag-specific proliferative response of wild-type mice, proliferation of CD4+ T cells was reduced in IL-12p35−/− mice. However, proliferation was completely abrogated in IL-12p35−/−p40−/− mice. These results demonstrate a defective Ag-specific proliferative response in the absence of endogenous IL-12p40. Finally, CD8+ T cells were analyzed for their Ag-specific cytotoxic activity. Syngenic peritoneal macrophages pulsed with M. bovis BCG and PPD were used as target cells for CD8+ T cells isolated from infected mice. Cytotoxic activity was present in IL-12p35−/− mice, albeit clearly lower than that observed in CD8+ cells from wild-type mice. The cytotoxic activity of CD8+ T cells from IL-12p35−/−p40−/− mice was further reduced to 32% of the maximum killing observed in wild-type mice. Collectively, these data show striking evidence for an agonistic and protective role of IL-12p40 by promoting Ag-specific Th1 and CTL effector functions. M. bovis BCG-infected IL-12p35−/− but not IL-12p35−/−p40−/− mice are able to mount Ag-specific T cell responses in vitro. Lymph nodes from C57BL/6, IL-12p35−/−, and IL-12p35−/−p40−/− mice were obtained 9 wk after i.v. infection with 2 × 106 M. bovis BCG. a, Lymph node cells were stimulated in vitro with M. bovis BCG-pulsed peritoneal macrophages and IFN-γ levels weredetermined in the supernatant 72 h later by ELISA. b, CD4+ T cell proliferation of triplicate cultures of pooled cells from five mice per group was measured after stimulation in vitro with M. bovis BCG-infected peritoneal macrophages. Differences between IL-12p35−/− and IL-12p35−/−p40−/− mice were significant (p < 0.001 and p < 0.01). c, Cytotoxicity of enriched CD8+ T cells from C57BL/6 (•), IL-12p35−/− (⋄), and IL-12p35−/−p40−/− (○) mice was assessed on M. bovis BCG/PPD-pulsed peritoneal macrophages from quadruplicate cultures as described in Materials and Methods. Results in a–c are expressed as the means with SD of three independent experiments. Because the agonistic IL-12p40-dependent activities described above leave open whether homodimeric IL-12p40 or the recently discovered p40p19 heterodimer (designated as IL-23) are responsible for protection we quantified expression levels by real-time RT-PCR in spleen from M. bovis BCG-infected mice 2 mo postinfection. In comparison to wild-type controls, IL-12p35−/− and IL-12p35−/−p40−/− mice showed a 3- and 8-fold increase in p19 mRNA levels (Fig. 5⇓ and Table II⇓). Neither IL-12p40 nor IL-18 was significantly increased in mutant mice compared to infected controls at this time point of infection (Table II⇓). Real-time PCR analysis of IL-23p19 mRNA expression in splenocytes of M. bovis-infected mice. Mice were infected i.v. with 2 × 106 CFU of M. bovis BCG (see Fig. 1⇑) and cDNA prepared from splenocytes of five mice per group. RNA from splenocytes from five mice per group was combined and PCR was monitored in real time with the fluorescent DNA binding dye SYBR green. The housekeeping mRNA β-actin was normalized before p19-specific PCR, and fold differences were calculated using the relative standard curve method (see Materials and Methods). Low abundance of p19-specific mRNA shown by relative high cycle numbers with 3-fold increase in splenocytes from IL-12p35−/− mice (circled line) and 8-fold increase in splenocytes from IL-12p35p40−/− mice (crossed line) compared with C57BL/6 (solid line). For comparison, see Table II⇓. Airborne infection with M. tuberculosis is the most prevalent infectious disease for humans worldwide. Consequently, we addressed whether the protective and agonistic role of IL-12p40, which we observed after infection with M. bovis BCG, has relevance for infection with virulent M. tuberculosis. To mimic the natural route of infection in humans, mice were infected with 100 CFU of the virulent M. tuberculosis strain H37Rv in an inhalation exposure system to induce pulmonary tuberculosis. In the absence of bioactive IL-12p70 all mutant mice died, whereas wild-type mice survived infection, confirming an essential protective role for IL-12p70 in experimental tuberculosis (Fig. 6⇓a). IL-12p35−/− mice survived up to 20 wk postinfection, whereas the life span of infected IL-12p35−/−p40−/− mice did not exceed the first 10 wk postinfection. IL-12p35−/− mice were also able to mount a DTH response similar to wild-type controls (Fig. 6⇓b) and similar IL-12p40 serum levels as wild-type controls (5 and 5.5 ng/ml, respectively) 16 wk postinfection. Infected IL-12p35−/−p40−/− mice were completely defective in their DTH response, suggesting impaired cell-mediated responses as demonstrated in the BCG model. Indeed, lymphocyte infiltration to the site of infection during early pulmonary tuberculosis was comparable to that observed in wild-type (Fig. 6⇓c) and IL-12p35−/− mice (Fig. 6⇓d), but appeared to be reduced in granulomas of IL-12p35−/−p40−/− mice (Fig. 6⇓e). Together, these results demonstrate residual resistance to M. tuberculosis in IL-12p35−/− mice which is dependent on the presence of endogenous IL-12p40. A protective role for IL-12p40 in M. tuberculosis infection. Ten mice per group were infected by the pulmonary route with 100 CFU of M. tuberculosis. a, Mortality of C57BL/6 (•), IL-12p35−/− (⋄), and IL-12p35−/−p40−/− (○) mice. Differences in survival time between IL-12p35−/− and IL-12p35−/−p40−/− mice were highly significant (p < 0.0001). Similar results were found in an independent mortality study using 13 mice per group. b, DTH response of C57BL/6 (filled bar), IL-12p35−/− (shaded bar), and IL-12p35−/−p40−/− (open bar) mice 28 days postinfection (five mice per group). Differences between IL-12p35−/− and IL-12p35−/−p40−/− mice were highly significant (p < 0.0001). c–e, Histological analysis of lungs 35 days postinfection. At sites of mononuclear infiltration lymphocytes were more prominent in C57BL/6 (c) or IL-12p35−/− (d) compared with IL-12p35−/−p40−/− mice (e) (bar = 50 μm). IL-12 plays an important role in promoting cell-mediated immunity against microbial pathogens. IL-12p70 is important for the host defense against mycobacteria as demonstrated by neutralization of IL-12 in vivo and infection studies using IL-12p40−/− mice (30, 31). Accordingly, in this study IL-12p35−/−p40−/− mice were susceptible to mycobacteria, showing a chronic infection with M. bovis BCG and 100% mortality after pulmonary infection with M. tuberculosis. The chronic disease in BCG-infected IL-12p35−/−p40−/− mice is in contrast to the rapid mortality observed in mice deficient for IFN-γ (32, 33) or TNF-α (34) responsiveness, demonstrating some residual resistance in the absence of endogenous IL-12p70. Surprisingly, IL-12p35−/− mice were able to control and clear infection with M. bovis BCG with only slightly higher CFU than wild-type controls, showing that effective immunity to M. bovis BCG is not dependent on bioactive IL-12p70. Moreover, IL-12p35−/− mice were less susceptible to pulmonary infection with M. tuberculosis than IL-12p35−/−p40−/− mice. These striking phenotypical differences in resistance to mycobacterial infection suggest a protective role for IL-12p40, independent of bioactive IL-12p70. In vivo therapy with IL-12p(40)2 reversed the susceptible phenotype of M. bovis BCG-infected double- deficient mice to a more resistant phenotype, providing direct evidence for a protective function of IL-12p40. Previous studies observing phenotypical differences in survival time and organ burden of Cryptococcus neoformans-infected IL-12p35−/− and IL-12p40−/− mice (22) have already indicated a protective role of IL-12p40. Moreover, in a cardiac allograft rejection model using IL-12p35−/− or IL-12p40−/− mice as recipients, other investigators could demonstrate the presence of alloreactive Th1 responses in the absence of IL-12p70 but presence of IL-12p40 (21, 35). Recently, an agonistic function of IL-12p40 produced by lung epithelial cells was also observed in a viral infection as well as in Salmonella enteritidis infection using IL-12-deficient mice (36, 37). Together with our mycobacterial infection studies and the successful in vivo therapy with IL-12p(40)2, we present striking evidence for an agonistic role of endogenous and exogenous IL-12p40. Subsequently, we investigated the cellular mechanism underlying the IL-12p40-mediated protection in mycobacterial infection. With respect to an agonistic role of IL-12p40 in mediating Th1 immune responses, we found comparable Ag-specific IFN-γ production by restimulated lymphocytes and Ag-specific proliferation of CD4+ T cell in BCG-infected IL-12p35−/− mice as in wild-type mice. In addition, in vivo T cell activation, as measured by DTH responses after injection of PPD, was unimpaired in M. bovis BCG- and M. tuberculosis-infected IL-12p35−/− mice. All these functions were severely impaired in infected double-deficient mice. Indeed, supplementation with IL-12p(40)2 was able to fully restore DTH responses in M. bovis BCG-infected IL-12p35−/− p40−/− mice, demonstrating a direct role of IL-12p40 in these T cell functions. The relationship between protection and DTH is not clear and may involve two separate mechanisms in the immune response to tuberculosis as discussed in a recent review (38). A DTH reaction in the skin after injection of PPD may be a similar reaction to granuloma formation in infected organs, involving the recruitment of large numbers of macrophages and sensitized T cells. In their review, Orme and Cooper (38) propose that protection is preferentially cytokine driven and DTH chemokine driven, the latter triggered by TNF-α. 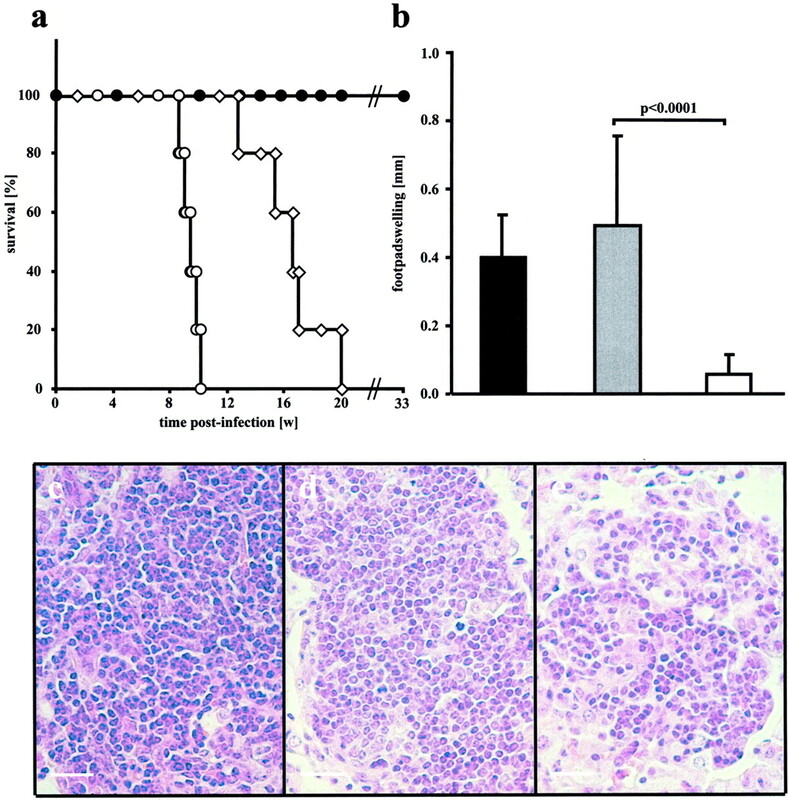 In this report we have shown that IL-12p40 appears a crucial factor for PPD-induced DTH. A possible explanation could be its chemotactic and activating properties on macrophages, which have been recently demonstrated in several studies (36, 39, 40). Concerning an IL-12p40-mediated CTL response, we showed residual cytotoxic activity of primed CD8+ T cells from M. bovis BCG-infected IL-12p35−/− mice on syngenic targets, albeit to a low level considering the relatively low maximum CTL response achieved in wild-type mice. In contrast, the cytotoxic activity of corresponding cells from IL-12p35−/−p40−/− mice was completely impaired. In IL-12p35−/− mice primary CTL responses against vaccinia virus were strikingly reduced; however, comparison with IL-12p35−/−p40−/− mice was not performed (41). How do these IL-12p40-dependent stimulatory effects on T cell responses explain the observed resistance in mycobacterial infection? Both CD4+ and CD8+ T cells are known to be responsible for protection against mycobacterial infection (42). The mycobacteriostatic and mycobactericidal effector mechanisms involved in protective granulomatous responses are known to be strictly dependent on a Th1 immune response (2, 4, 5) because IFN-γ produced by Th1 cells (43) activates the mycobactericidal effector functions of macrophages (44, 45). These responses are normally promoted by IL-12p70 (6). Moreover, MHC-I-restricted cytotoxic CD8+ T cells are able to lyse infected macrophages directly (46, 47). These T cell effector functions were present in M. bovis BCG- or M. tuberculosis-infected IL-12p35−/− mice; therefore, granuloma formation and function were rather normal in these mutant mice, suggesting that endogenous IL-12p40 is involved in stimulating mycobacterial-specific T cell effector functions. Previous studies using IL-12p40−/− mice showed exacerbated susceptibility to M. bovis BCG (11) or M. tuberculosis (12), with defects similar to those observed by us in IL-12p35−/−p40−/− mice. The residual resistance, albeit on a high infective and chronic burden in M. bovis BCG-infected IL-12p40−/− mice (11) or IL-12p35−/−p40−/− mice, demonstrates the presence of a residual and protective immune response in the absence of IL-12p40 and IL-12p70. This residual protection could be attributed to IL-18, because IL-18 mRNA was present in the spleen of M. bovis BCG-infected IL-12p35−/− and IL-12p35−/−p40−/− mice (Table II⇑). The recovery of macrophage activation in M. tuberculosis-infected IL-12p40−/− mice has previously been shown to be mediated by IL-18 (12). 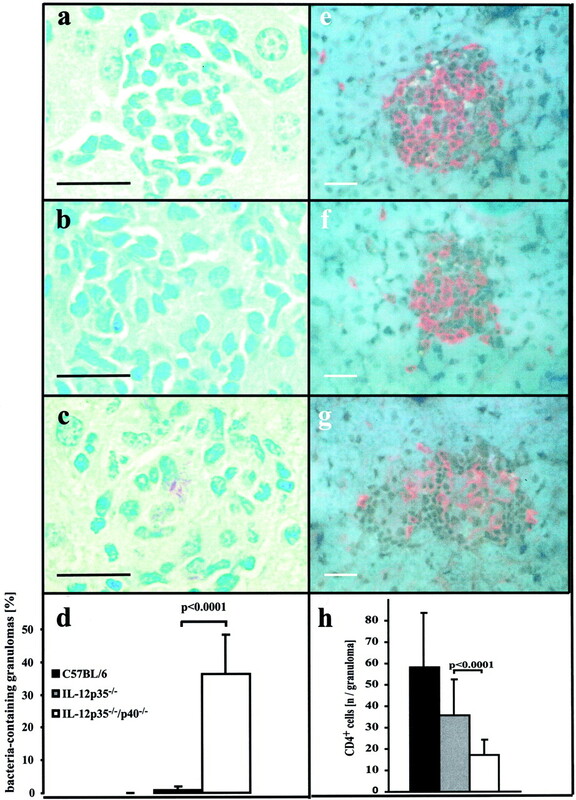 However, 7 mo postinfection, double-deficient mice showed severe histopathology in infected organs, demonstrating the limited role for IL-18 and other protective responses in the absence of IL-12p40 and p70. From our studies it is also evident that IL-12p40 is able to effectively substitute the bioactive functions of IL-12p70 in M. bovis BCG-infected IL-12p35−/− mice in an agonistic fashion, but only partially in M. tuberculosis-infected IL-12p35−/− mice. These gradual differences in protection may be due to the higher virulence of M. tuberculosis H37Rv compared with M. bovis BCG but nonetheless highlight the crucial importance of bioactive IL-12p70 in M. tuberculosis infection. Currently, we are investigating whether IL-12p(40)2 may be used as an immune adjuvant to optimize BCG vaccination. IL-12p70 has recently been reported to be effective as an adjuvant (48). It is not clear why IL-12p(40)2 functions as an IL-12p70 agonist in some systems but as an antagonist in most others. Mechanistically, we seem to understand the antagonistic function of homodimeric p40 on natural killer and T cells (16, 29, 49, 50, 51). The p40 subunit of the IL-12p70 heterodimer binds to the IL-12Rβ1 chain, and signal transduction by IL-12p70 is mediated by interaction of the IL-12p35 subunit with the IL-12Rβ2 chain of the IL-12R. Homodimeric IL-12p40 competes with IL-12p70 for binding to the IL-12Rβ1 chain of the heterodimeric IL-12R (15). The observed stimulatory effects of IL-12p40 on T cells are likely to be mediated through this receptor component in an agonistic fashion. Zou and colleagues (52) reported that IL-12Rβ1 and IL-12Rβ2 associate with different Janus kinases and therefore may contribute to distinct signaling pathways: the cytoplasmic domain of IL-12Rβ1 associates with tyrosine kinase 2, while the cytoplasmic domain of IL-12Rβ2 interacts with Janus kinase 2. Hence, IL-12Rβ1 may be capable of transducing IL-12p40 signals via tyrosine kinase 2, a possibility that remains to be investigated. An alternative, perhaps more likely, explanation is that IL-12Rβ1 associates with an as yet unknown component of the IL-12R. A hitherto unidentified third component associating with the IL-12Rβ1 subunit was recently reported (53). More recently, a p19 protein has been identified which combines with IL-12p40 to form a novel, biologically active cytokine, designated as IL-23, with similar but discrete functions from IL-12p70 (54). It has been shown that IL-23 binds to IL-12Rβ1 but not to IL-12Rβ2, and a potential new signal transducing transmembrane receptor subunit has recently been identified (R. A. Kastelein, unpublished observation). Formation of biologically active p19p40 heterodimer seems to require intracellular synthesis of both subunits because it is a disulfide-linked dimer. However, some mouse p19 is also secreted in the absence of p40, at least in transient expression experiments (54). If complex formation with monomeric p40 to IL-23 is also possible extracellularly, we cannot exclude the possibility that the minor fraction of monomeric p40 present in the administered p(40)2 used for supplementation studies may have caused the therapeutic effect by IL-23 complex formation with endogenous p19. However, because there is a 100:1 molar excess of homodimeric p40 which may compete with newly formed p19p40 complexes for binding with IL-12Rβ1, we would further need to speculate that p19p40 has a far greater affinity than the p40 homodimer, to explain the therapeutic effects. Indeed, p19 mRNA was hardly detectable in all strains, with only a 3-fold increase of p19 mRNA found in M. bovis BCG-infected IL-12p35−/− mice compared with wild-type controls. Unfortunately, no information on p19p40 affinities to IL-12Rβ1 is currently available (R. A. Kastelein, unpublished observation). Moreover, neutralizing Abs to block IL-19 in IL-12p35−/− mice or IL-12p35−/−p40−/− mice are currently not available (R. A. Kastelein, unpublished observation) which would allow us to test this hypothesis directly in vivo. However, a p19 gene-deficient mouse strain has been recently generated and is in the process of characterization (R. A. Kastelein, unpublished observation). Planned mycobacterial studies, including comparative infections with intercrossed p19−/−p35−/− mice and p19−/−p35−/−p40−/− mice will univocally clarify the contribution of endogenous p40 independently of p19 (i.e., IL-23). Furthermore, supplementation of p35−/−p40−/− mice vs p19−/−p35−/−p40−/− mice with p40 homodimer will determine whether IL-23 complex formation is possible and responsible for the agonistic and protective role of p40, demonstrated in this study. We thank A. Fehrenbach, M. Alexander, W. Dwyer, L. Fick, M. Simpson, and M. Jacobs for excellent technical assistance, R. Kirsch for histopathological advice, and H. Arendse, C. Keating, and P. Japhta for organization of the animal facility. We thank Drs. Andreas Lopata, B. Fenemore, and R. K. Straubinger for assistance with immunoblot analysis of the p40 homodimer. Homodimeric p40 was a kind gift of Drs. F. Podlaski and M. Gately. ↵1 This work was supported in part by the Medical Research Council and National Research Foundation of South Africa. G.A. is supported by a project grant (AL371/3-1) from the German Research Foundation. F.B. is the holder of a Wellcome Trust Research Senior Fellowship for Medical Science in South Africa (Grant 056708/Z/99). ↵2 Current address: Molecular Infection Biology, Research Center Borstel, Borstel, Germany. ↵4 Abbreviations used in this paper: p(40)2, p40 homodimer; DTH, delayed-type hypersensitivity; PPD, purified protein derivative; BCG, bacillus Calmette-Guérin.